Good morning everybody!!! I woke up 2 hours before and it was time to get ready for the Kenzo show at Paris fashion week which starts in only 30 minutes. So I am taking 5 minutes (which might take a little longer hehe) to write this article. It’s all good! Most shows start with a delay of 30 minutes, so we are very flexible. So far, it’s been going amazing, Paris being our last “sprint” of this fashion month marathon. I have to say, we are happy that it’s the last city a our body’s energy is slowly catching up on us and asking for some rest. Our minds though are all about “go go go” and honestly don’t want to stop. Oh if only I could switch off my body and not feel the sleep or the hunger, that’d be so amazing! Yesterday we did something great. Our day started with fittings, presentations and several shootings to then end up as a little evening off, recharging our batteries around a box full of macarons from Pierre Marcolini a.k.a the best macarons of Paris for me. We seriously needed this as we’ve been running like crazy people for weeks. There’s always an event to go to, always a party, a dinner, a show. It’s nice for once to say no and take some time for yourself to be able to then enjoy things even more. Fiona and I loved having this short moment off, which actually ended up becoming also an office work evening. With all our activities, it’s also important to find time to edit and send these images!!! We shot these images on our second day at Milan fashion week on which I decided to wear something more formal and classic to attend the Fendi show. We were filming for Grazia the whole day, a behind the scenes of our typical fashions week day and so I needed something comfortable to be able to run in. I am seriously a huge fan Joseph and their elegant sleek cuts. To add a pop of color, I added this beautiful Louis Vuitton bag as well as some Bee Goddess jewels from the Talisman Gallery, thanks to LoveGold like who introduced me to their colorful, playful pieces that I ended wearing almost on a daily basis. I love all the details of the rings and necklaces, so fine and delicate yet with so much edge and beautiful shapes. Hope you guys will enjoy! Your Jimmy Choo shoes are absolutely stunning. Gorgeous look, I love the shoes and accessories! Check out www.marihenud.com for travel & fashion! Beautiful outfit, so elegant and timeless! Love the pants so much and the layered necklaces! Words can't even describe you how beautiful you are❤️Love this look! Wow, you are indeed fast in writing an article :) Love this outfit, it looks so elegant with the blue&white striped palazzo pants! So chic and stylish! I love those stripped pants! Love this outfit, those trousers are amazingggg! And the shoes! The pants are so cool! Great combo! I loove your hair! amazing outfit, I love your pants!! Great outfit, like that pants, it looks so nice on you! Nice blazer and pants! Very chic look! I totally wish we could just switch of our need to eat and sleep sometime, but I guess it's our body's way of reminding us that we need to rest from time to time. I'm totally loving these trousers, they look awesome. stunning! love your blue ring so much! You look so gorgeous, as always! This outfit is so amazing, especially love the striped trousers! You look wonderful as always! This is such a pretty, classic outfit! However, in my opinion you are over-photoshopping some of the portrait pictures. That appears a little doll-like then.. I don't think you should do that and I don't think you have to since you are so pretty! Stay healthy and fabulous! Love your look as always! Im so damn envy of your life! By the way, I am so disappointed to not live in Paris, I'm from Bordeaux and I would love to see you !! stunning and pretty as always! Amazing outfit, love your accessories! Amazing outfit as always and I adore your hair color. Beautiful look! Love this messy hair! Gorgeous as always! Those pants are awesome! Oh, dear, you are stunning with these pants! Stunning trousers. I love the focus on jewelry. You are one of my biggest inspirations and I hope you enjoy your last days in beautiful Paris. Such a col outfit! I love how you mixed high and low end! I also love reading all of your amazing stories from various fashion weeks! Reminds me of the 70s because of the pants structure and style! I love the vibrant blues coming from your outfit, especially from your ring! It's so beautiful and enchanting! Love this look! The pop of color really makes this great!!! 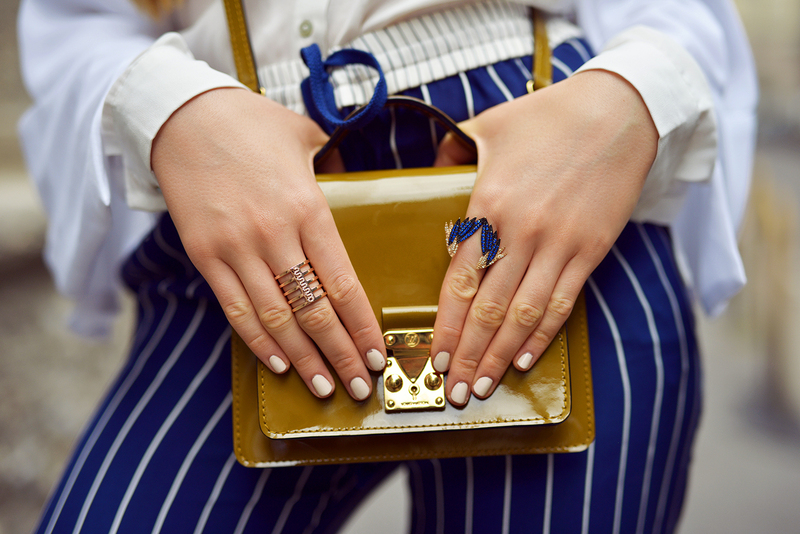 As an English person, totally obsessed with these Joseph trousers, and the blue bird ring is so beautiful. I would normally say: not my style, at all. But you made it work, once again! I am astonished, in such a positive way, how well these items worked together! So elegant an chic! Totally love the rings. Hey, sometimes, quiet time with Fiona editing images is a breath of fresh air that you need! Can I just say that I LOVE that ring, Kristina?! I went on LoveGold's webpage to see if I could shop their products, but I didn't see where I could click and buy. Are they just all about the world discovering the brands they have to offer or do they not sell from their website too? The jewelry is just ah-mazing, I love it! Omg, I'm in love with those shoes!!! 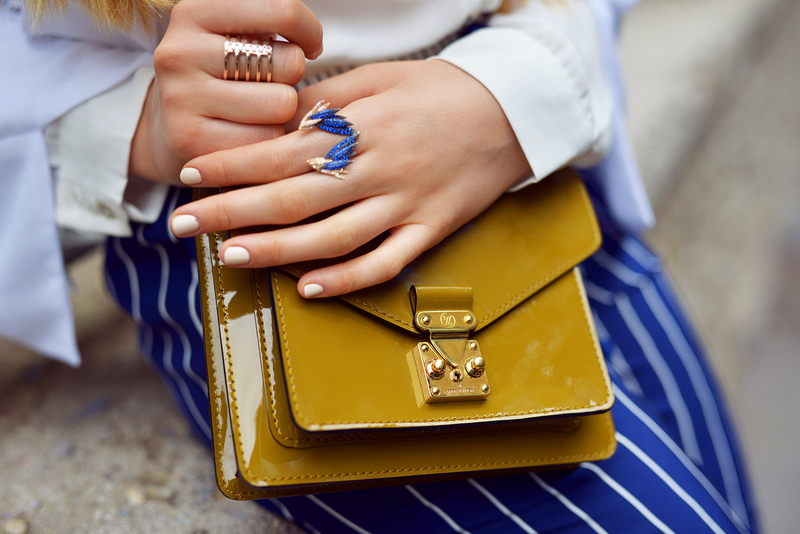 love mustard and navy as a colour combo! THOSE PANTS!!! Wow - perfect outfit. Amazing outfit! Simple but so elegant! It basically is determined by what form of HDTV you are asking the question about. horizontally to show a 720-line HDTV picture. most appropriate place in your home can provide the most effective television viewing experience for your whole family. size from the HDTV. Hdtv antenna dealers The Panasonic Viera TC-l37S1 37" LCD HDTV offers full 1080p resolution approximately $850. Well, an antenna is only a piece of metal which transmits and captures radio wave frequency. This will be the reason why these antennas are usually added to high ground high is less obstruction for this way it can receive the signal in the straight line. Outdoor off air hdtv antenna Note: There are several ways to make a homemade HDTV antenna which is just one from the simpler ways. the 1st radio station in San Jose, California, known as KQW. that reflects the society of that time period. in just a range of hundreds of miles away in the transmission point. The big news in Texas (and round the country) that day was the memorial service being held for four firefighters who had recently died during duty. things, but in a new situation just like a radio interview you can take a wrong turn. forget about ourselves; or sometimes we only think of ourselves and ignore others. it is quite portable and does give quite a close shave. To save funds on electricity, ease up on the air conditioner. utilizing dull razors which pull at the hair strands rather than cutting them cleanly. it from the power source or the electrical outlet. reception was poor just before (or completely gone). Surely, the brain are nothing such as the Wi - Fi connections to cloud platforms. Antenna The Wi - Fi USB Tremendous Antenna is an up-to-20 d - Bm High-Gain assortment booster omni-directional antenna. You should get hold of a DVR to record the surveillance videos. to tape suspicious activity, a camera to observe along with the cables for connecting them together. videos in DVD quality through S-video, RGB or YPb - Pr video outputs. a common reply to all your protection problems which is just not the case. tunes, then look for one particular having a microphone jack. use of architecture and negatiive space in his designs. It's really a great and helpful piece of information. I'm happy that you shared this helpful information with us.